作者: The AsiaN Editor on 10 April , 2019. The government is set to submit an extra budget bill to the National Assembly this month, amid growing downside risks over worsening economic conditions at home and abroad. The extra budget is also aimed at coping with fine dust air pollution. The International Monetary Fund has recommended that South Korea needs an extra budget of some 9 trillion won to support its sluggish economy. South Korea’s export-reliant economy is showing signs of weaker growth, hit by sluggish private consumption and global trade disputes. The government has projected the nation’s economy to grow between 2.6 percent and 2.7 percent this year. Using the extra budget and other fiscal measures, the government will put its focus on achieving this year’s growth target, the minister said. 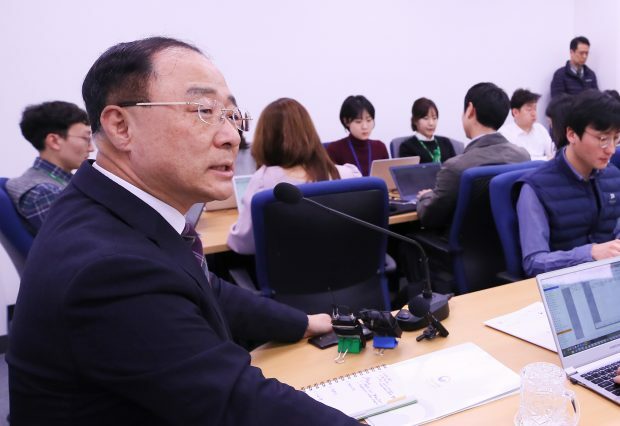 Earlier this month, the government declared special disaster areas in Gangwon province, offering financial and medical support to help recover from a massive wildfire. Hong said part of the extra budget will be used to help the government improve its manpower and equipment to better cope with wildfires. South Korea saw its jobless rate slightly fall to 4.3 percent in March, helped by the government’s efforts to create more jobs, with newly added jobs surpassing the 200,000 marks for the second straight month. Hong said the March job data could add a “cautious, but positive momentum” to the economy.